Hello everyone! I hope your week is going well! My Grandkids went home yesterday and I spent today trying to get caught up with some projects. This card is a sneak peek at two of the new Our Daily Bread designs sets to be released on June 1st! I'm so excited about these sets! You do not want to miss the Blog Hop on June 1st! I used this week's Midnight Madness Sketch for my layout. My base is Blush Blossom and then Papertrey Vintage Cream which I embossed with the Cuttlebug and lightly sponged the embossed areas with Blush Blossom. My lacing elements are triangles cut out to expose the base, then laced with gold cord from my stash. My image is from the soon to be released Our Daily Bread designs set "From Me To You". I LOVE Fuschia and have been having so much fun coloring this image.... but for this card I simply embossed it in gold and then painted it with Opal Shimmerz. I wish that showed up in the photo, but it doesn't. The verse is from a "surprise" set to be released on the first as well!!!! That's all I'm going to say for now! You'll have to check back then to find out more about it! 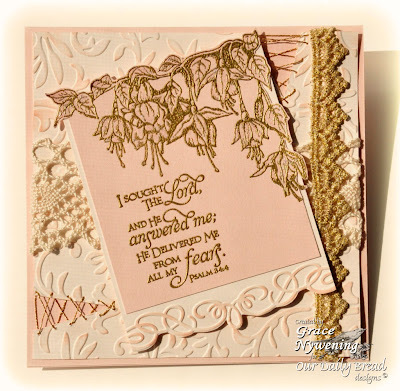 I embossed on Blush Blossom CS and then matted that on more cream. I cut out part of the image for more interest. I added wide lace and some gold lace by Webster's Pages. If you haven't checked out the Blogaversary Party going on at Midnight Madness, you might have missed that there is a special award (The Priscilla Award) being given away to one person who will be voted on by YOU! I am blessed to be one of the 20 finalists selected by the DT from among the Gold Star Winners this past year, but now the voting is up to how many friends you can get to vote for you. Well.... I have lots of friends but not too many blog! LOL! If you would like to check out the contestants and place your ONE vote for your choice... please see this post. Of course I'd love to have your vote, but also be sure to sign up for the HUGE giveaway going on for this one more week! Thank you so much for looking and I love knowing you were here! Have a blessed week! OHH, Soooooo BEAUTIFUL. Great design!!! Grace, this is such a gorgeous card! The embossed cs with the sponging is beautiful. The ivory lace and gold lace tie in nicely with the criss/cross laced pieces. Grace, your detailing on this just makes this verse shine...I love all the embossing and the cutout vinery!! My friend, Linda, gave us a sneak peek of this today, I am loving this idea and can't wait to see the new sets released!! I wish you well with the contest, either way it is an honor to be a contestant!! Your work is always gorgeous!! So elegant and SOOOO beautiful Grace...WOW your embossing looks fabulous!! What a stunning card sweetie! How beautiful, Grace! I love the elegant embossing and color scheme. How absolutely gorgeous and elegant this is Grace! Love the colors you put together here and of course that the image and scripture are so perfect! 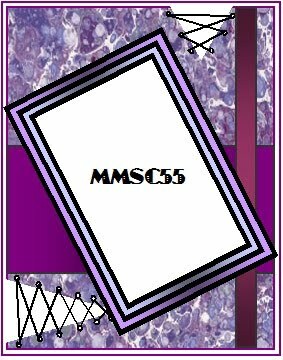 I hope you win the MM contest my friend! You deserve it!!! This is so beautiful Grace! Those fuchsias looks amazing. I love the soft colors and the laces. Thank you so much for sharing this beauty! Ohhhh wowwww Grace,What a beautiful card. Grace that is gorgeous, I really like the muted tones, that stamp looks marvelous in a single color, its a nice way to show it off without having to color it all in. Very pretty! I like this new set from all the sneaks I have seen. Your warm colors and that lace trim is wonderful! This is stunning Grace!! 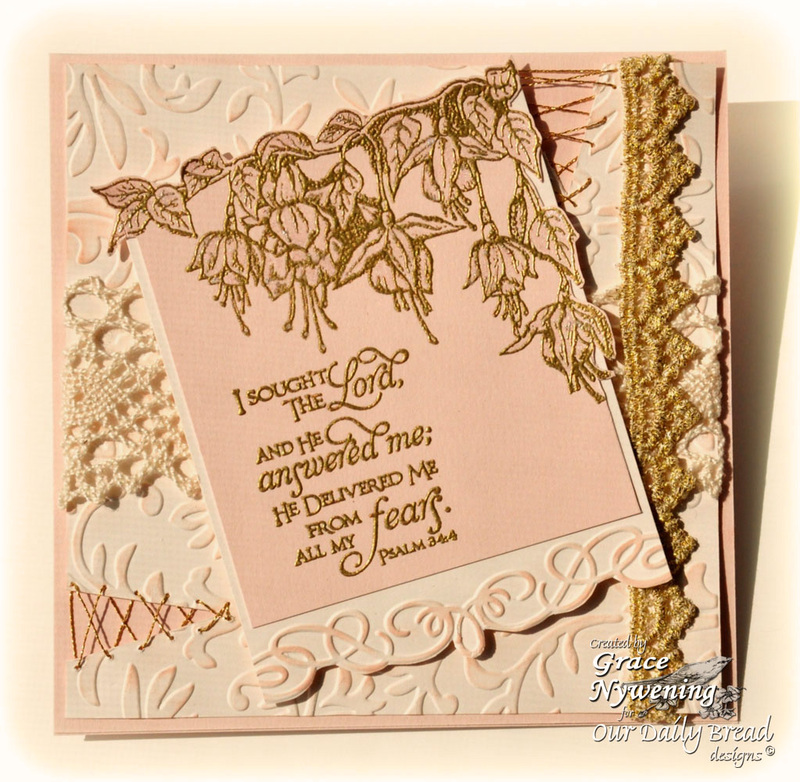 I just love the pink, the embossing, the lace and the textures!! What a gorgeous take on the sketch!! So Pretty and elegant. Beautiful card, thanks for joining us at ABC this time. Absolutely gorgeous Grace. Love that stamp set. I've got to make my way back over to ODBD. Haven't been there for far too long. Wonderful to catch up and browse your beautiful creations again. Miss you...hope all is well. Have a wonderful weekend. Grace this is just gorgeous. I love the colors you chose and how you carried the color of the stamped image with that piece of lace that matches so well. The embossing adds interest and elegance. What a beauty. Great job with the sketch this week. Thanks for playing along with us this week at the Midnight Madness Sketch Challenge. Grace, this is just such a pretty card with all the dry embossing. Lovely colors and lace and the verse is such a beautiful one! congratulations on being one of the 20 finalists for the Priscilla Award and for Gracing us each week with your creations (no pun intended).